Walking down the street to our local Museum of Contemporary Art where there is a long line waiting for the exhibit: Future Beauty: 30 Years of Japanese Fashion, that started in July and runs until October 6, we chanced upon a long parade of whimsical creatures on both sides of the Fukagawa shopping street in Koto ku. 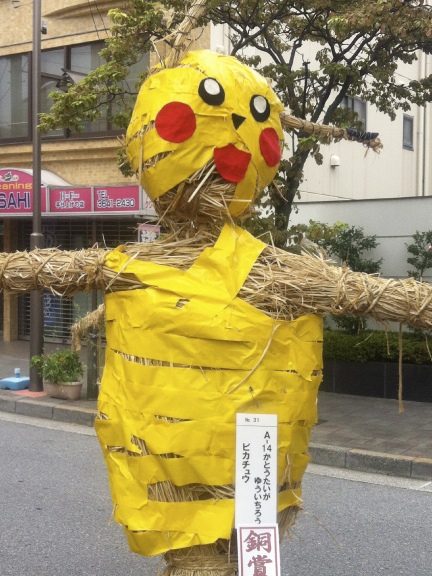 This is the annual Fukagawa Scarecrow Competition, and every year it reaches new heights of homemade ingenuity and fun and outlandishness. 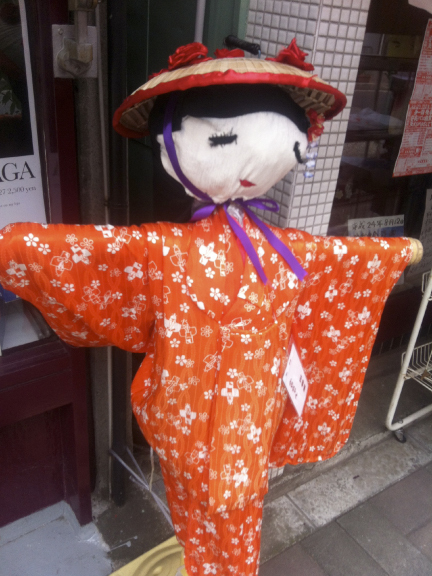 It attracts visitors from all over to see how far scarecrows have come from their original form of work clothes stuffed with straw and stuck on a bamboo pole in rice fields to frighten away crows. Indeed! It works! There are no crows here! 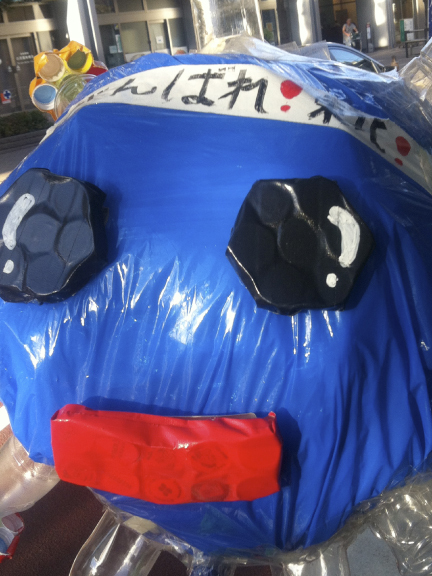 Instead there are fresh and spontaneous and wacky works of people’s imagination, using mostly the materials at hand – bubble wrap, bottle tops, newspaper, plastic bags, old cloth. That is what is endearing about it. Old familiar things have been saved and transformed into funny figures and sometimes cartoon characters, and creatures of fantasy. 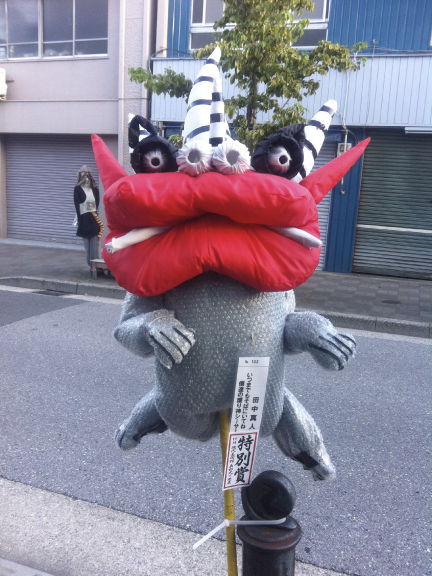 Above is a prancing red lipped, striped horn Shiza from Okinawa. 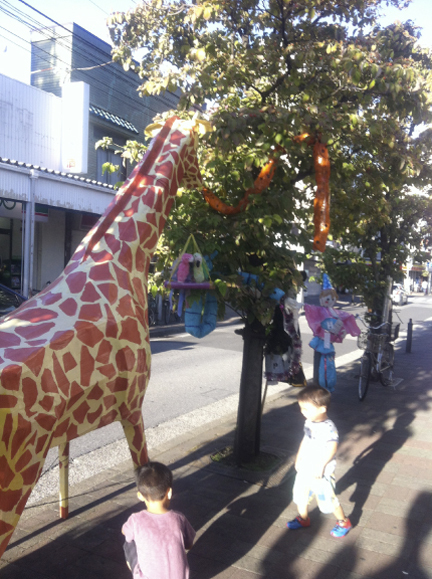 There is a huge giraffe, and next to him a blue snake in the tree, alluding to next year’s zodiac animal. There is a stately but funny goddess in front of a temple and princesses and oafs. Pictures tell the tail far better. This is a famous fullsome female impersonating television panelist – news to me! This is Shizuka Gozen, an historical beauty from the 12th century, a court dancer whose dance brought rain to the Emperor, after the chanting of 100 monks failed to do so. 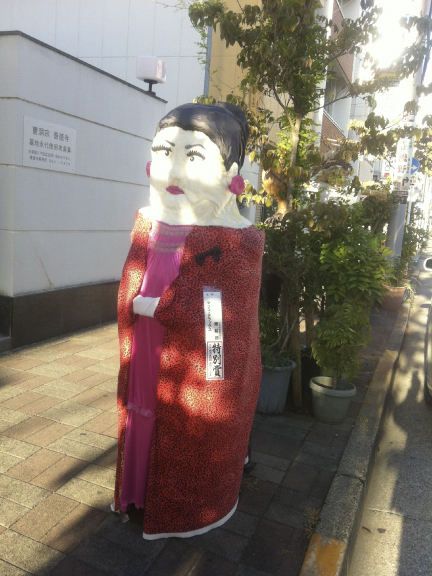 Some of my favorites were the rice straw figures, a material which Japan has always used masterfully. 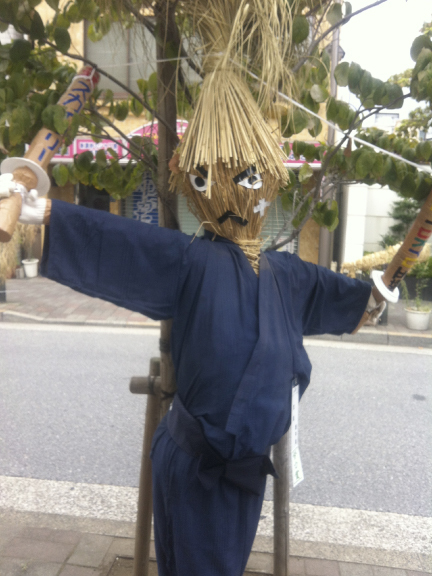 The scarecrows were grouped somewhat by kind, and my favorite section was the fanciful, whimsical pieces: Not too anime. Not too drawn from cartoons, but pulled up somewhere from the inner combustion of the imagination and the materials. A jaunty striped snake for next year. Not sure what this one was, but since it was blue & white it got my prize! The array of characters went on for blocks and blocks, on both sides of the street. 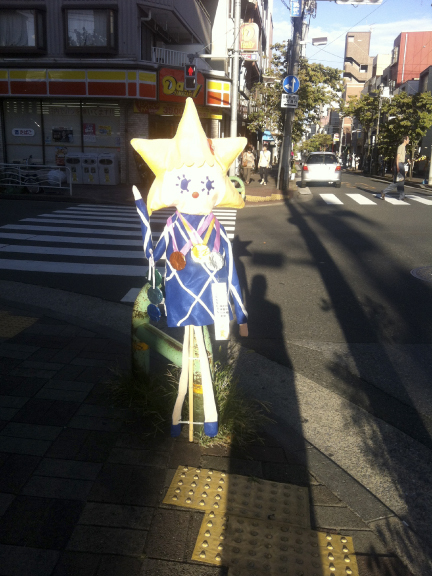 And just when I thought we had seen them all, we came upon a simple and irresistible Blue Boy who was, like many of the other scarecrows, cheering for Tohoku, where the scarecrows originated. 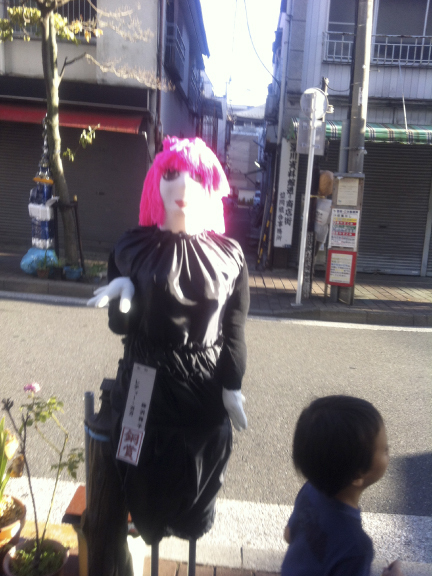 When I asked a woman from the shop nearby, about this winning Gambare Tohoku figure, she told me it was the creation of third graders at the Primary School across the street. 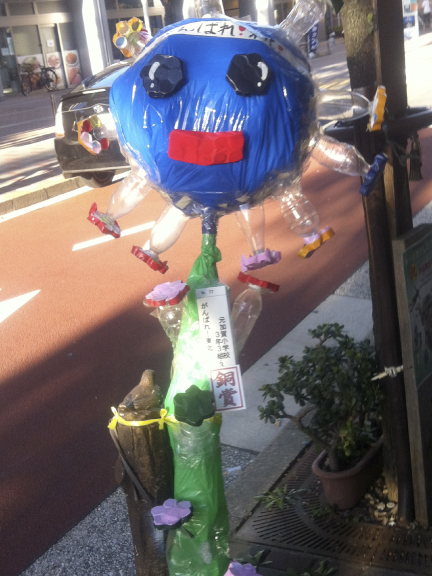 They had made it of plastic bags and bottle caps and colored tape, and pet bottles as they are called in Japan. Tomorrow is the last day of the competition – how lucky we were to have seen it just in time! – and the scarecrows would all be marched to the Museum of Contemporary Art in Kiba, where there would be a judging at 3 pm. Come and see it, she urged. 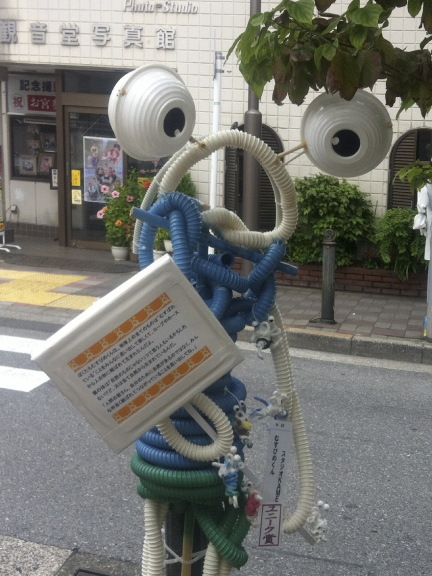 But maybe I prefer them, just as they are, street art conjured up from the hearts and minds and hands and trashcans of Fukagawa in downtown Tokyo, a wonderful area in our neighborhood. It was growing dark as I was heading home from Blue & White tonight. 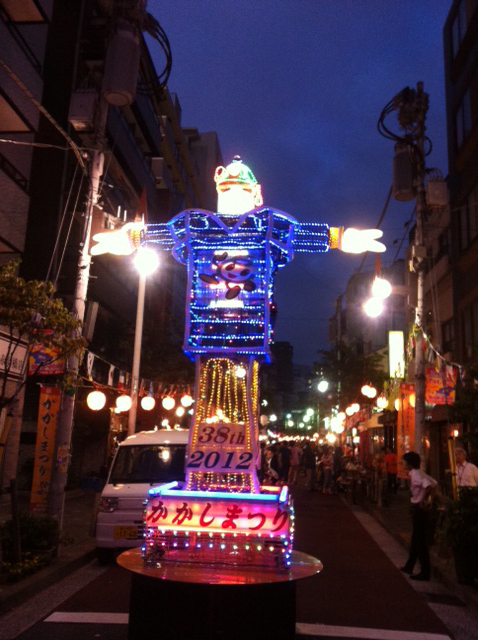 Bright lights and excitement were coming from the Higashi Azabu crossing. 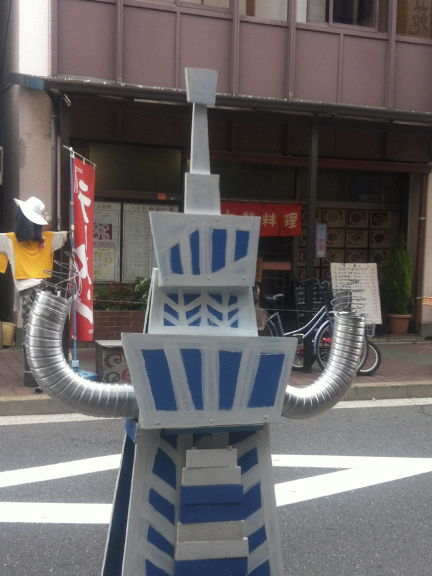 To my amazement there was a huge scarecrow robot blinking in excitement over the scarecrow festival/matsuri celebration. Full moon overhead as children and their parents in Yukata danced and delighted in the happiness of harvest. 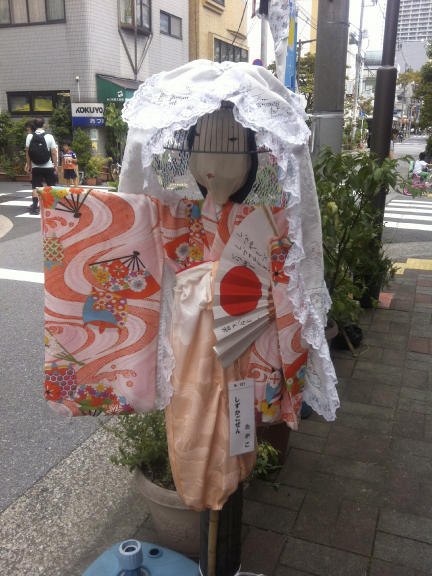 Despite all the images to the contrary, Japan/Tokyo still has a country heart. I was thrilled to be able to see it with you. 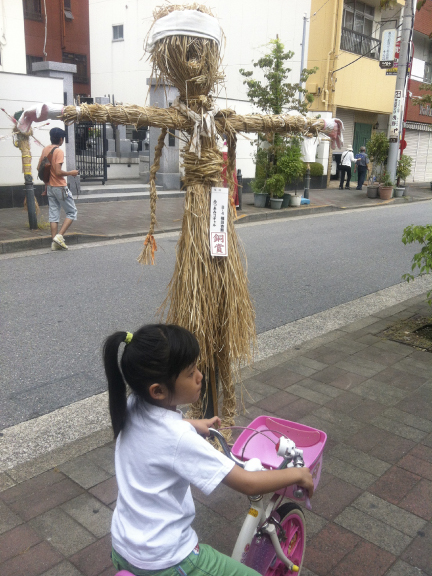 The scarecrows were spirited and whimsical and they made so many on the street smile, often stop, and start up conversations. Congratulations for celebrating this event and so many others that give Japan its glorious personality. That reminds me that Mejiro station had a long line of those standing each year about this time. Maybe they should have been outside rather than inside because there certainly were plenty of crows where we lived. I remember that crows have never been favorites of yours. 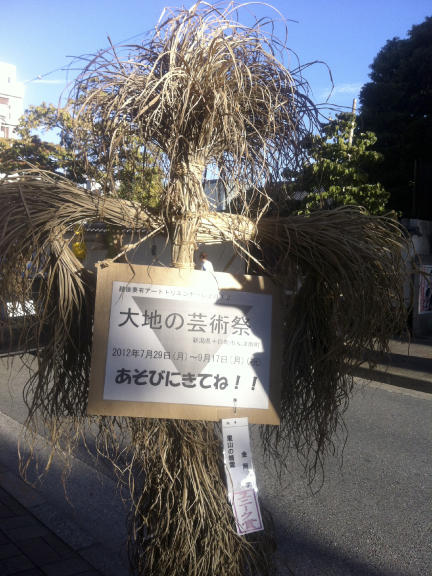 Definitely the scarecrows would be more effective OUTSIDE the station. Amazing creativity. How fun. Each entry sparks my imagination. Thank you for the photos. 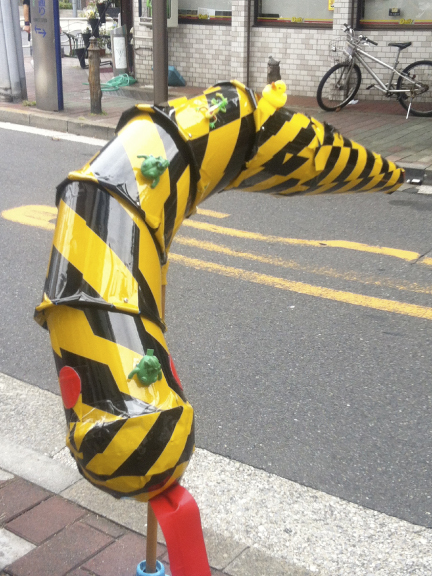 Living in Tokyo is a dream, because you don’t know what to expect around the next corner. You only need to keep your eyes open, all the time. A good idea wherever you are !